Skulky, vocal, brush dweller – more often heard than seen. Moderately common; the only thrasher east of the Rockies and central Texas. Prefers scrubby woodlands, thickets and hedgerows; often found near the ground, foraging in leaf litter for insects, or eating berries; sometimes seen on the ground at feeders near good cover. 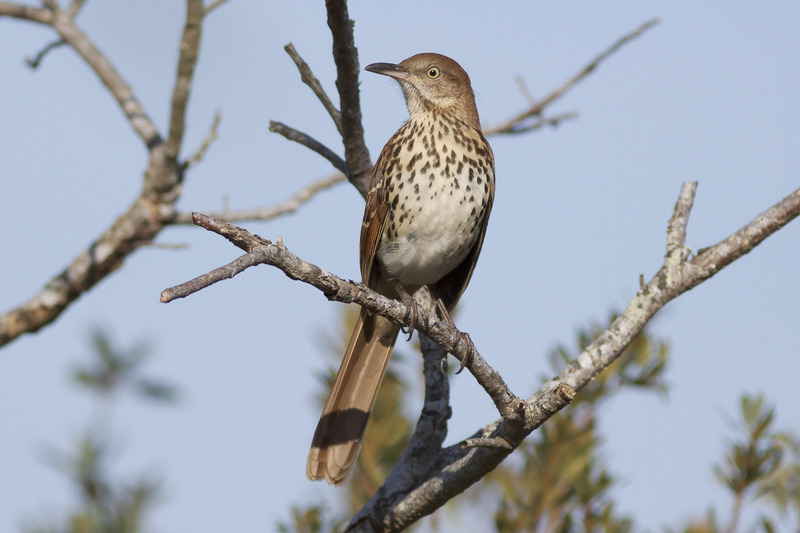 Large and slender, with long legs, tail and bill, which is curved; rufous brown above, and whitish with heavy streaking below. Flight is fluttery and slow. May perch up higher to sing its long, rambling song that mimics other birds, often in couplets; also gives a sharp “smack” call. Aggressively defend their nests, often found in thorny shrubs or low trees, and young fledge quickly (9 days). Lifespan up to 12 years. Population ~ 5 million and declining, possibly due to habitat loss.